The National Hurricane Center has issued a hurricane warning from the mouth of the Pearl River, Mississippi, to the border between Alabama and Florida. A hurricane warning means hurricane-force winds (74-plus mph) are expected in the area indicated beginning this evening. Tropical storm warnings are posted from west of the mouth of the Pearl River, Mississippi, to east of Morgan City, Louisiana, including Lake Pontchartrain and Lake Maurepas, as well as from the Alabama-Florida border to the Okaloosa-Walton County line in Florida. A tropical storm warning is typically issued when tropical-storm-force winds (39-plus mph) are expected in 36 hours or less – by Tuesday afternoon, in this case. Residents along the northern Gulf Coast should rush preparations to completion before conditions begin deteriorating this afternoon. 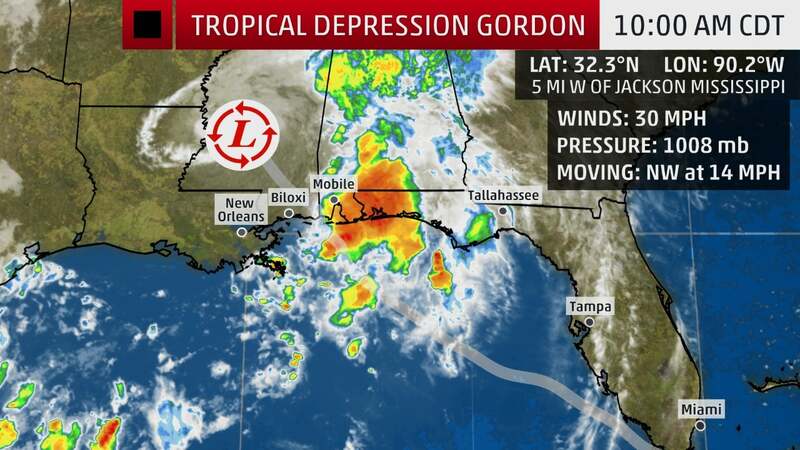 Gordon is currently centered about 190 miles east-southeast of the mouth of the Mississippi River. Gordon's forward speed is relatively fast for a tropical cyclone, generally between 15 to 20 mph. Gordon's heavier rainbands are now moving toward the Florida Gulf Coast, but have cleared the rest of the Florida Peninsula. 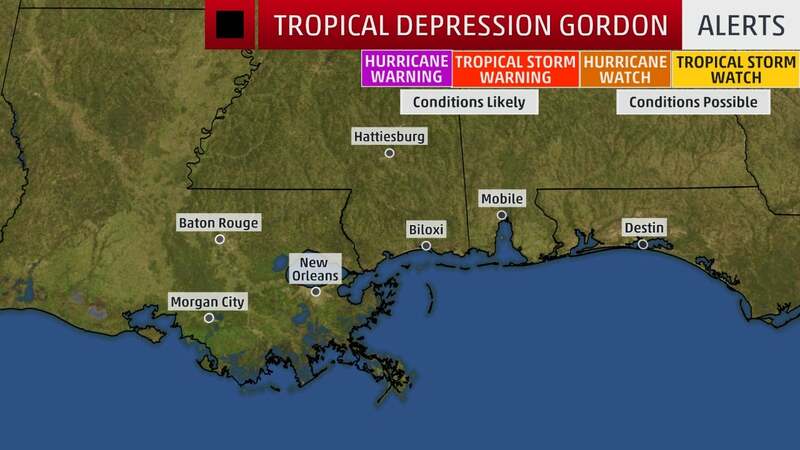 Gordon is forecast to be a Category 1 hurricane near the time it makes landfall on the northern Gulf Coast tonight most likely along the Mississippi Gulf Coast. Given a tropical cyclone's strongest winds are usually are on its eastern side, that's why the NHC issued a hurricane warning for parts of the Mississippi and Alabama coasts. 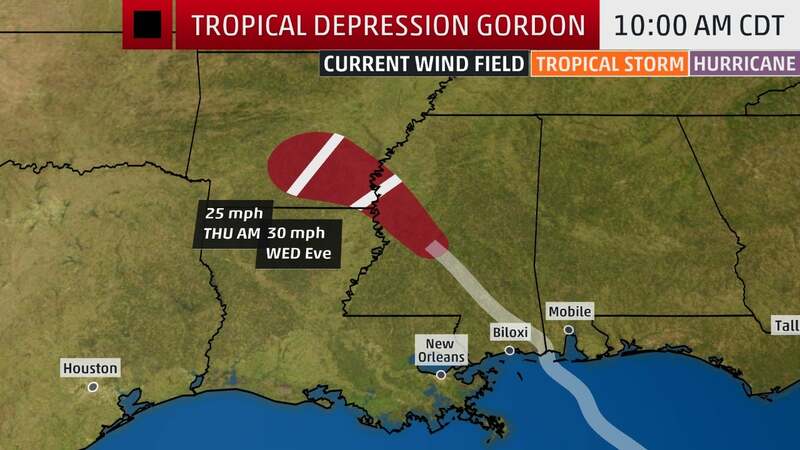 The heaviest rainfall from Gordon is expected to occur generally along or to the east of its track from the northern Gulf Coast to parts of the Arkansas through Thursday. Localized totals of up to 12 inches are possible in some areas. Local flash flooding and some river flooding is a good bet in this region, spreading from south to north late Tuesday into Thursday, including the Mobile, Alabama, and Jackson, Mississippi, metro areas. Flash flood watches have been posted by the National Weather Service for parts of southeastern Louisiana, southern and central Mississippi, far southeastern Arkansas, southwestern Alabama and the western Florida panhandle. 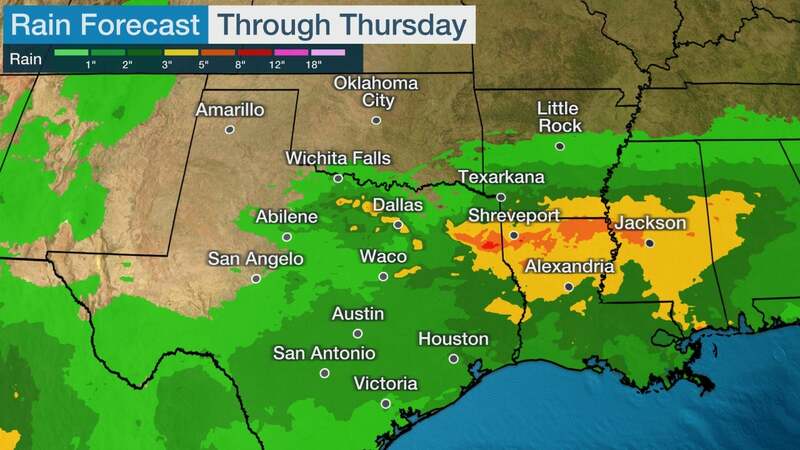 Separate flash flood watches are in effect in southeastern Texas due to heavy rain from another weather system affecting that region into Tuesday morning. 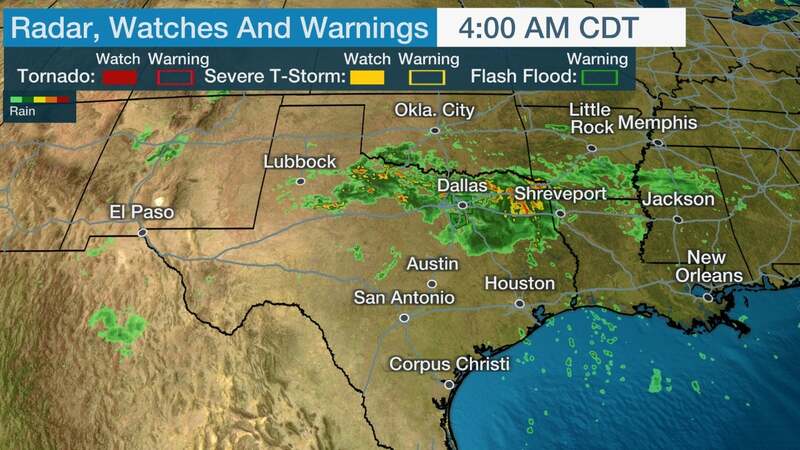 That system produced street flooding in downtown Galveston, Texas, Monday morning, as can be seen in the tweet above. A storm surge warning has been issued from Shell Beach, Louisiana, to Dauphin Island, Alabama. This means in the hours prior to and after landfall, parts of this coastline will see a dangerous, life-threatening storm-surge inundation. A storm surge watch continues from west of Shell Beach, Louisiana, to the mouth of the Mississippi River and from east of Dauphin Island, Alabama, to Navarre, Florida. 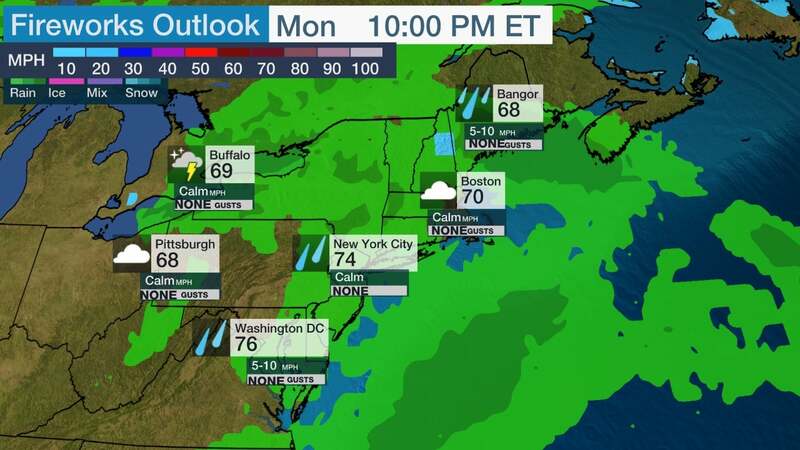 The deepest water will occur along the immediate coast near and to the east of the landfall location, where the surge will be accompanied by large waves, according to the National Hurricane Center. Here are the times of low and high tides along the northern Gulf Coast. There is an evening low tide in the storm surge warning area, followed by a high tide just after 7 a.m. Wednesday. 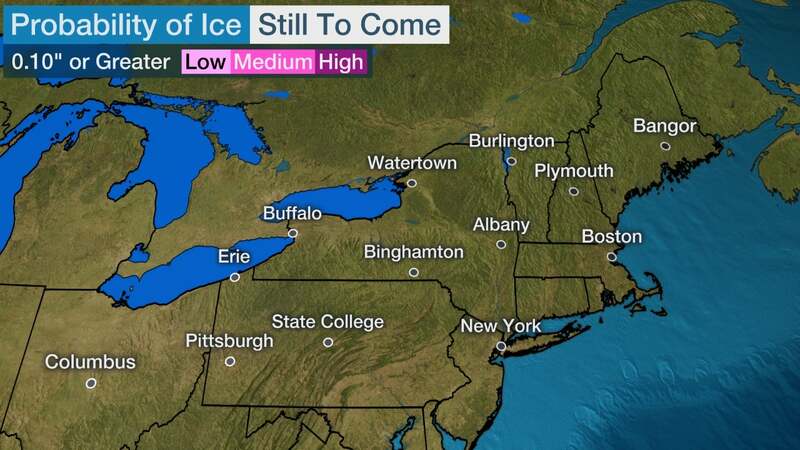 The peak surge should arrive between the times of low and high tides. Some lingering coastal flooding may occur into Wednesday in areas of onshore flow, and dangerous rip currents are likely on the northern Gulf Coast, and swimmers are encouraged to stay out of the water. Seas are expected to build to 6 to 10 feet by Tuesday, according to the National Weather Service in Mobile, Alabama. By Tuesday afternoon, tropical-storm-force winds are expected to arrive on the northern Gulf Coast in the tropical storm warning area. Hurricane-force winds are expected in the hurricane warning area by Tuesday evening. Downed trees and power outages are expected where the tropical storm and hurricane warnings are posted along the northern Gulf Coast. This is expected no matter whether Gordon is a strong tropical storm or a Category 1 hurricane at landfall. 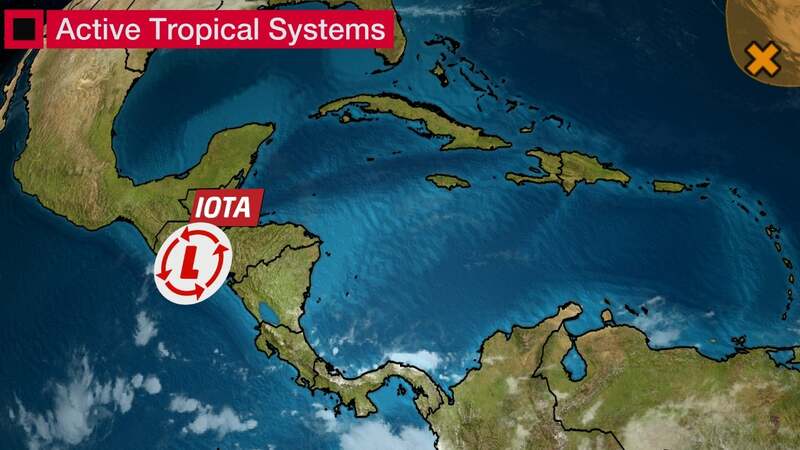 Advisories were initiated on "Potential Tropical Cyclone Seven" on September 2, a type of advisory NHC uses to issue watches and warnings with more lead time on tropical disturbances expected to eventually develop into tropical cyclones. In this case, tropical storm watches were first issued for the northern Gulf Coast a full two days ahead of the arrival of tropical storm-force winds. On Labor Day morning, Tropical Storm Gordon formed near Florida's Upper Keys, based on surface wind observations and Doppler radar data from south Florida. Heavy rain pounded parts of South Florida, triggering flash flooding in parts of Miami-Dade County, including Homestead and areas near Miami International Airport. The center of Gordon even passed near Marco Island on Labor Day, which took a direct hit from Irma almost one year ago. An elevated weather station near Key Biscayne, Florida, measured a 63-mph wind gust Monday morning while a 54-mph gust was clocked at an elevated station near Miami Beach. Sustained winds of 45 mph with a gust to 54 mph were observed Monday morning at an elevated WeatherFlow station near Dania Beach, Florida. Closer to the ground, a wind gust to 51 mph was reported at Miami's Opa Locka Executive Airport on Monday morning.